Can you help us make the Fox River accessible to everyone? Imagine the Fox River being enjoyed and explored by people of all abilities. The Fox River is a natural water feature running through the City of Waukesha. With your donation, we can make the river accessible to all people, regardless of physical limitations. New kayak launches would provide kayakers a stable and dry entry to water. One launch includes launch-assist paddle notches for support in kayak entry and exit. 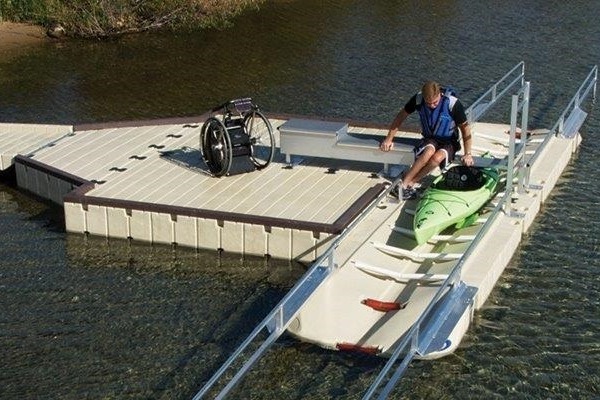 The Americans with Disabilities Act (ADA)-accessible launch includes guide rails for easy access in and out of the water, launch rollers for easy movement of the watercraft, a transfer bench with two heights for easy transfer from wheelchairs, and transfer slide boards with two heights for differing watercraft sizes. The Park Foundation of Waukesha, Inc. enriches the quality of life in Waukesha through enhancement of city parks, trails, recreation programs and the urban forest. The goal to cover the cost of the kayak launches is $18,000, and the Park Foundation of Waukesha is excited to offer a matching grant of up to $9,000, so your donation is worth double! With your support, this vision can become a reality! Thank you!! The Park Foundation of Waukesha, Inc. is a 501(c)(3) organization and can receive tax-deductible donations.